Pictured is an architect’s scheme of the addition to the Glencoe-Silver Lake high school/junior high if a May 12 building bond vote passes. Glencoe-Silver Lake’s first public forum regarding its proposed building bond had a slim turnout Monday evening — three residents, two school board members and a reporter. Nevertheless, Superintendent Chris Sonju and Business Manager Michelle Sander explained the estimated $24 million project — slated to be on a May 12 ballot — which includes plans to close Helen Baker Elementary School in Glencoe and add on to the high school and junior high school campus. Sonju and Sander said that fixing all the issues at Helen Baker — from windows to the heating system, to a renovated kitchen to the electrical system, among a variety of other issues — would cost about $8 million. And that is only a partial solution, said Sonju. There simply isn’t enough space at Helen Baker to accommodate all the educational programs, and the $8 million would only address the structural needs, not the space issues. “That’s just to fix what’s here now, not to add anything,” said Sonju. Helen Baker has a detached media/computer center because there is not enough space in the original building. And because the gym is used every hour for physical education classes, students often spend their recesses in hallways and the cafeteria when it is raining or too cold to go outside. The proposed project, Sonju said, is a scaled-down version of the 2011 proposal, but because of rising construction costs, it will cost more. The 2011 proposed project had an estimated cost of about $18.5 million. This year’s proposal is to add K-2 classrooms to the north end of the Lincoln Junior High building, which would be a two-story addition. 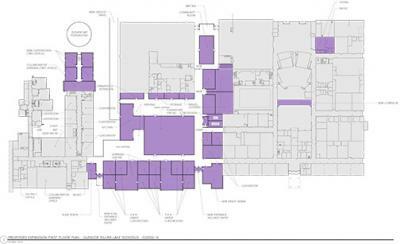 Other classroom space, for seventh and eighth graders, is proposed on the south side between the junior and senior high buildings. Behind those classrooms — to the north — will be a new kitchen, elementary cafeteria, high school cafeteria and a two-section gym for elementary physical education. The current Lincoln gym could also be used for recreation and as a multi-use learning area, the administrators said. Classroom space also would be added to the west side of the current high school, along with a multi-use space. Near the north parking lot, between the high school and Panther Field House, will be a new community and meeting room. For more, see the April 1 print edition of The Chronicle.